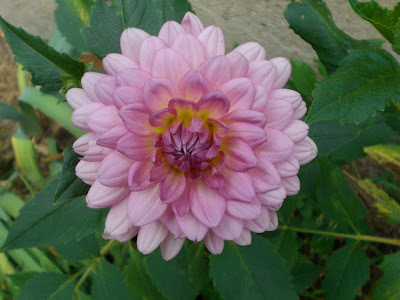 gardening in the boroughs of nyc: Dahlia the size of a human's head? I'll be the first to admit it that I always fall for the marketing on packaging. So when I saw this Dahlia package at Lowe's this past spring, I had to try it. On the package, there was a picture of a Dahlia the size of a child's head! 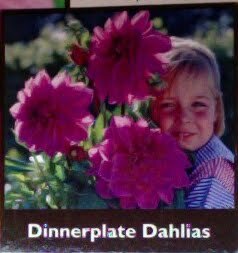 They call it the Dinnerplate Dahlia. Here it is finally in bloom! I should have photographed it next to my big head to show you that it's not the size it said it would get to. Definitely not the size of a child's head. It's probably more like a size of a softball. Oh well, at least it bloomed! Does anyone know, should I dig up these bulbs before winter and replant them again next spring? Or should I just leave them in the ground? It doesn't say on the packaging. A softball is a pretty good size though, don't ya think? Even of it isn't the size of a kid's head it is still a really pretty flower! You took a great picture of it, too! Sorry, I'm not so sure about digging up your bulbs, but if it were me; I'd do it just in case. Better safe than sorry. It depends on where you live. I live in Zone 4 and I have to dig my bulbs or they will FREEZE! I store them in my basement cupboard, it is about 55 degrees in the winter there. I store them in a box of peat moss. You can't let this beauty die! Nice dahlia! Yes, dig them up and dry them off in the autumn sun, then store them somewhere dark for the winter, or they'll get frozen in the winter. Oh it is so pretty even though it isn't as large as you anticipated. I would dig it up and replant in the spring. gorgeous! Yeah, I think in NY, you should dig them up. I don't dig mine up, but our ground hardly ever freezes here in MS over the winter.